Not sure which is worse: referring to one of these as a "rigid feminine pleasure device," or attacking a cop with one. The Chicago Tribune reported that the RFPD assault took place when an officer visited a woman's home to investigate a claim that she left a restaurant without paying. Few details have been made available other than the nature of the weapon, which is probably just as well. Also in Chicago, a woman was charged with child endangerment after police found her drunk and holding her infant son "under her arm like a football." The woman said she was celebrating because the state Department of Children and Family Services had dropped an investigation into the child's safety. After getting this new data, DCFS seems to have changed its mind and decided to intervene after all. The inability of Britons to walk safely on cobblestones, and the lawsuits they file as a result, are causing the disappearance of the traditional cobblestone street, reports the Sunday Telegraph (via Overlawyered). A survey found dozens of instances where cobblestones had been removed or paved over, which local authorities said was due to "applications for compensation from people claiming to have fallen over on cobblestones or to have experienced some sort of accident caused by them." 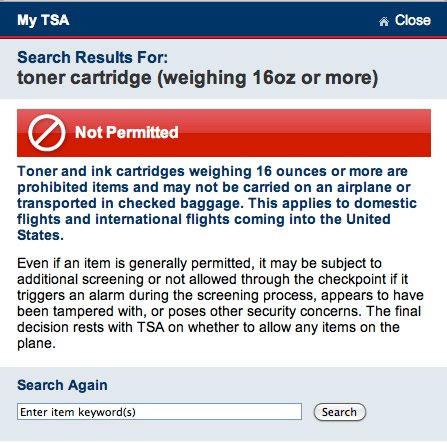 After the incident in which bombs were found hidden in ink and toner cartridges on cargo planes coming from Yemen, the Homeland Security Department has done the sensible thing and banned ink and toner cartridges larger than 16 ounces from all flights. Especially in combination with the continuing ban on snow globes, this will leave terrorists with nothing at all to put explosives in. Other than cartridges 15 ounces or less, anyway. A professional matchmaker in Manhattan is threatening to sue her landlord, saying that being stuck in an elevator for 25 minutes cost her a fee of up to $500,000. Janis Spindel claims that her billionaire client, who had flown in from Oregon on his private jet just for their meeting, was upset about the delay and left. It appears that Spindel also wants out of her lease, but says if the landlord won't do that and pay her moving expenses, he should have to pay her the $10,000 per minute she lost due to the elevator ordeal.